LAHORE, Pakistan (CNN) -- At least 42 people died and more than 150 were injured when heavy rains caused buildings in Pakistan's largest city, Karachi, to collapse, according to provincial health and police officials. Fourteen of those died in one building when its roof collapsed, authorities said. The city's communication systems went down Saturday and there were widespread power outages because of the storms. Most of the deaths occurred because of roof collapses and some electrocutions, a police official said. The government has declared an emergency situation in all hospitals, according to Maj. Zia ul Hassan, the police chief of Sindh Province. He said his police were helping get the injured to hospitals and recover bodies from collapsed homes. The storms uprooted trees and toppled billboards on Karachi streets, causing massive traffic jams and some injuries, officials said. More monsoon rain is forecasted for Pakistan within the next few days. 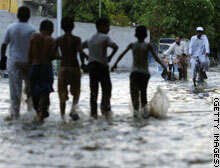 Pakistani youths walk along a flooded street in Karachi.